The Mutant Underground wrestles with the idea of recruiting the Inner Circle to assist them. Andy considers reconnecting with his family when he learns about his father's powers, but Lauren may not be as willing to have him back as her parents. I still root for Lorna and Marco and their cute chemistry. I hate her being on the Inner Circle side. On the other hand, Andy continues to go all darkside. I wanted to crack up laughing when poor Thunderbird was totally surprised that the enemy did show up to rescue him. And then it became super shooty. 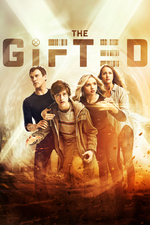 The Gifted is wildly imperfect, but it still has a lot of great scenes, like the twins advancing through the building and blasting everybody out of the way and then Blink making the guy shoot himself, and shrugging it off as 'it's complicated'. Plus, it's one of the best portrayals on television of how fascism can arise in a supposedly liberal society. I'm finally catching up. Man this was a fun episode, but also so full of tension and a great exploration into how extremism builds. Jace being ready to believe John and then feeling like he was totally betrayed was such a good moment. It's like the conspiracy theorists that see the one thing that totally puts them into the believer zone. We might stand back and laugh, but to them, it's so real that they can't believe we're laughing. And then biased news channels like the one portrayed just totally backs them up.